Tearing things down, to build them up again. Bits and pieces are left-over. 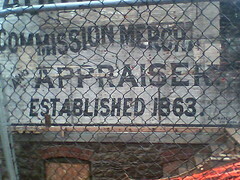 The sign, above, was awoken from its slumber, but there are no more auctions, and it will be gone by the end of the month. Elsewhere, more houses will be vanquished. Which is a good thing. Just as long as we don’t end up looking like down-town Wilkes Barre, or Flint, Michigan! The Diocese of Scranton in January will begin an evaluation process of its 224 parishes as part of a large-scale restructuring plan that will include consolidating and closing churches. Yes. That’s all well and good. But…. Ann Marie Davis, office manager at St. John Neumann, said she thinks many parishioners were upset about the closings and consolidations. �Some people, I think, have stopped coming to church altogether because they are so upset,� she said. Hrm…. If they were such weak Catholics they they stopped going to church when churches consolidated through financial need, then they weren’t particularly strong Catholics to begin with. Yes, yes, the Church welcomes all into its fold, and the Lord loves the sinner who returns (prodigal children, and all that). But these people do not make good neighbors. The fire started in July 2004 when someone set a stolen car on fire and the fire spread to a coal refuse pile then moved underground. The U.S. Office of Surface Mining plans to isolate the 8-acre fire by digging a trench around it and allowing the fire to burn itself out. Take your pick. My only regret is that Mr. Griffith did not feature the Coney Island with the best tasting wieners (yah, we’ve got two of em!). But it does look the best. “Immigrant Law” examined for Scranton, or, Hazleton, exported. There are 46 miles of hard road and heavy-duty truck traffic between downtown Hazleton and the heart of Scranton, but City Council President Judy Gatelli would have you believe that it�s a smooth ride for illegal immigrants. Interestingly, Mrs. Gatelli has a strong voice echoing her contention that there�s an exodus heading north on Interstate 81 now that Hazleton has passed an ordinance that says businesses can not employ or sell goods to illegal immigrants and landlords can not rent to them. Admittedly, Mrs. Gatelli has neither hard numbers nor official estimates of the number of illegal immigrants in the city. However, she does have a feeling they are here, and she wants to do something about that.